IL1 binds antigen CD121a, which is a transmembrane glycoprotein and a member of the immunoglobulin superfamily expressed on T cells, thymocytes, dendritic cells, fibroblasts, vascular endothelial cells, epithelial cells and neural cells. CD121a binds the mature forms of IL1 alpha, IL1 beta, and IL1 Ra proteins. High affinity binding and signalling by the type I IL1 receptor requires CD121a and the accessory protein, IL1 R AcP, which does not bind IL1 alone, but forms a dimer capable of binding IL1. Interleukin 1 (IL1), which has a role as a mediator in inflammation, consists of 2 separate but related proteins, IL1 alpha and IL1 beta. Cell surface receptors for the 2 forms of IL1 are identical. IL1R Type I contains a single membrane spanning segment, a large cytoplasmic region, and an extracellular, IL1 binding portion composed of 3 immunoglobulin like domains. Beaulieu LM., et al. (2014) Arterioscler. Thromb. Vasc. Biol. 34:(3)552-564.Moos V., et al. (2000) Arthritis Rheum. 43(11):2417-22. 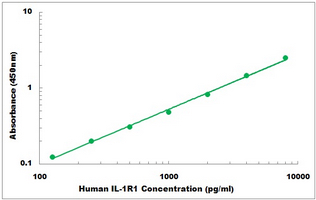 IL1R1 polyclonal antibody (A01), Lot # 050912JC01 Western Blot analysis of IL1R1 expression in HL-60 ( Cat # L014V1 ). 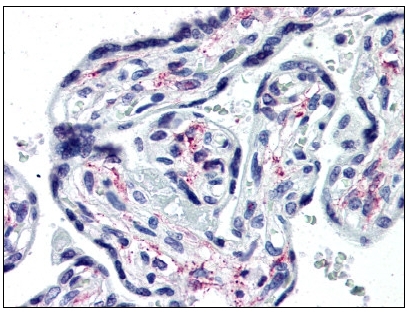 AM20494PU-N IL1R1 antibody staining of Formalin-Fixed, Paraffin-Embedded Human Placenta at 10 µg/ml followed by biotinylated anti-mouse IgG secondary antibody, alkaline phosphatase-streptavidin and chromogen.